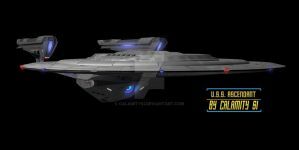 This is the main bridge of the USS Theurgy in the Star Trek: Theurgy story, and it is partially based on a USS Vengeance model by Calamity Si with his consent. The 3D model was a commissioning by Kalashnikov 3D. It was made in Blender and the compatibility with Sketchfab was done by Kalashnikov. LCARS screens partially made by Alexander Richardson (LCARSgfx) and the final edit to materials and lighting was made by me. Here is the link to the Sketchfab model, where you can pan around and zoom in on details. Just make sure to enable the HD resolution if your computer allows it, and go hunt for the Easter eggs hidden on the displays. The design holds a new back compartment for fighter squadron ops, which can be directed by using the tactical holo-table. It is called the Mission Ops center, and can also be used for other away missions.